I don’t know, but it had better be, or we are all really stuffed. Meetings (at least, the many, many that I’ve attended) are – with rare exceptions – dispiriting, boring, formulaic and unhelpful for people looking to actually DO something. b) making them LESS attractive to those who currently attend for the grandstanding opportunities/as a social activity rather than as a way of being useful. c) making them more attractive to those who want to know more about issues/perhaps see how they can help, without having to worm their way into the group’s controlling clique. 2) Create the infrastructure and expectations that people can gain public esteem as a pro-active part of a campaign/group without attending soul-sucking monthly/fortnightly/weekly meetings. There are also activists (I’m one) who would be delighted to support other groups’ activities, but not if it can only be done after attending poorly chaired/facilitated meetings that start late, are riven with irrelevancies and often go nowhere. The first thing is, the campaign group has to have some plausible medium term goals, under a “SMART” rubric (be that business world’s “Specific, Measurable, Achievable, Realistic timeframe”) or Political Dynamite’s smart or rhizome network’s smart). If the campaign is staggering blindly from next rally to next march to another meeting, none of the techniques suggested below will alter its final painful death (though they might, sadly, prolong it). If a campaigning group can’t – or won’t – “orient,” then within the “OODA loop” there can be no sensible decision or action… And anyone who cares about their long-term mental and political health will be walking quickly without panic to the exits. Why will people be coming to the meeting? What will they want? What will success look like to them? How will it be clearer to everyone what their ongoing participation in the group could be? How will it be clearer what they will get out of involvement in the group, what the hoped-for change is in the short to medium term (six months to two years). How will it be clearer to them how success is defined? When a person withdraws from a group, there are usually a set of reasons. Some reasons will be “good,” others may be covers for other issues. This is information that is crucial to the long-term sustainability of the group. There is absolutely nothing to be gained by arguing the toss with the individual. Not arguing does not mean you accept their perspective as correct, just that you accept that they have their views and are entitled to them. N.B. This information should be considered confidential (for sharing only with other core people, under conditions of anonymity). If you start blurting this stuff out, you destroy your own credibility, and – even worse – you will not get honest feedback from other people who leave the group at a later date, since they will be worried their views are going to be broadcast. ask them if you can contact them in six months to see if they’ve got more time/energy/enthusiasm/etc. after welcomes, house-keeping, intros, “agenda agreed?” etc. Focus on the campaign in question – very quickly remind everyone of what the specific problem it hopes to address is, what change is hoped for, when the campaign started, successes so far, when it hoped to “win” by, where things are up to right now, and what the next step (under discussion) is. Recap briefly what has been done since the last meeting by people who are not at the meeting (this goes in the minutes too). 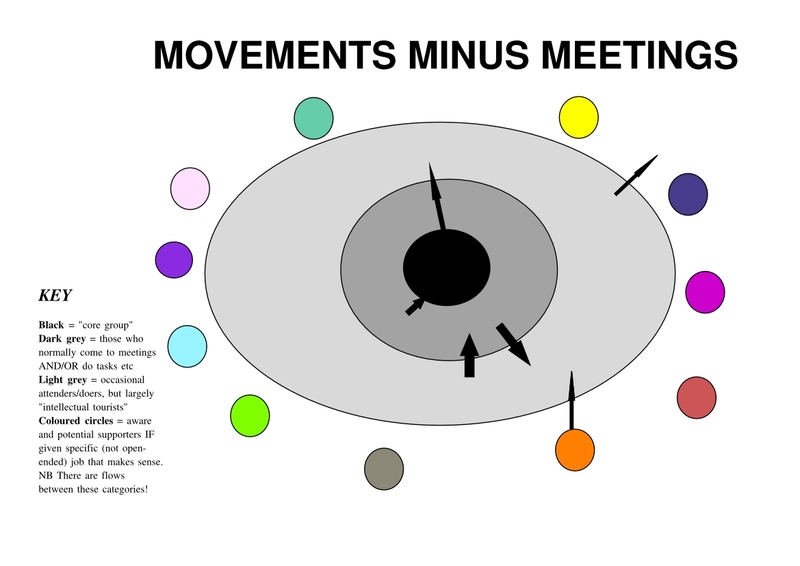 This will give people a sense that a) there are others not at the meeting who are also pulling in the same direction (useful if the meeting numbers are low!) and b) that their efforts will be recognised if there are meetings they do not attend. Alternatively, you can have a “traffic light” system of a flip chart sheet with all the tasks that need to be done, and if they are completed/on track (green), behind but under control (yellow) or way behind and mission critical/have been lunched out (red). ALSO consider having Gantt charts and Ishikawa diagrams to represent progress. Much snazzier than a list! Small groups focused on specific tasks will generate ideas/solutions more quickly than one big group. It is also easier for new people to volunteer ideas etc in small groups (though the quality of this process depends on reliable reporters-to-plenary, who capture the ideas without ignoring those of newbies/those they don’t like and highlighting their own). REMEMBER, people are going to be scared if they stick up their hand for one thing, they’ll be then be volunteered for a load of other things. And remember, that some people will want to come to multiple meetings before they make any decision to get involved. Tough as it will be, it is also important to look at the tasks that weren’t done by the initial person/team who said they would? Was the task then completed by a new team? At what if any cost to their other work/morale/energy? If the task wasn’t done/handed over in a decent time, then the questions “why not?” and “what assurance is there that this was a one-off?” must be asked. What were the consequences of the tasks non-completion? How did this affect other people’s work? Were their efforts rendered useless or less effective? If there weren’t any consequences of the task not getting done, is there a lesson here – why do work that doesn’t matter (while not condoning the fact that the task got lunched out). But be careful not to do this at the start or finish of the meeting. If at the start, you’ll lower everyone’s enthusiasm. If at the end, it’s what people will remember the most! Maybe do it immediately before the break? Trouble is, sometimes the issues take time to thrash through, and are uncomfortable, and people will use the need for a break as a way of closing the discussion down. Maybe immediately after a break? People who have said they might be up for things are texted/phoned to see if they are willing to do a task. There is then a report back after the break to say who has taken on what task, who has declined and who couldn’t yet be contacted. This will tell newbies that they don’t HAVE to come to every meeting, and that they might get a phone call/text at some point, but they are free to say “no, too busy”. “Declined tasks” will then definitely have to be re brainstormed – who else can do it? Who will ask them? If no-one comes forward, does the task need to be redesigned? Have two copies, with carbon paper in between (or take a digital photo of it), so that one copy goes with the person accepting the task and the other stays with the organiser. * there are people not in the room tonight who are making valuable contributions and will continue to do so. * that we are winning. Aha. Now the fun starts. If at all possible/appropriate, the organise(s) should go on to the pub with people from the meeting. Let your hair down, live a little, etc. And if you need to tell yourself that sometimes the best ideas come from a pint, then tell yourself that, but also seek professional help for that nasty case of chronic puritanitis. BUT, the next day the outcomes of the meeting must be communicated to the wider world. You can do this just by typed-up minutes. And you DO need to circulate minutes, that contain “decisions taken”, “tasks taken” (does not have to include names etc, because those people AT the meeting have taken a task slip, and those who weren’t at the meeting but said yes via text/phone message will be getting a separate email) and “tasks outstanding, with description, deadline”. Why not try – podcasting the “decisions made” and “jobs that need doing” of the meeting? People can then listen to the list while answering their emails etc. Why not slap together a quick youtube with some good music over the top of it? “Hi, we’re group x. (Logo) We’re doing y to solve problem z. We had a meeting last night and divvied out loads of worthwhile jobs to ourselves to make y happen. BUT we still need people with [x amount] of spare time in the next [number] weeks to do the following tasks. Put your “jobs list” on the website, and then put a comedy “taken” sign on any that do indeed get volunteered for. Maybe a cheesy way of showing how many tasks still outstanding after a week. Inevitably, a small group of people are going to do MOST of the work, but with effort it is possible to push from 80:20 to say 65:35. And to nurture some new inner core people. I hope. Once someone has said they’ll do it, they ARE going to need to be chased, with a progress report/part of the work needed before the deadline, so that if the task isn’t going to happen, there’s time to get a Plan B.
Footnote Two: So, why doesn’t this difficult work of “loose co-ordination” happen? Well, nobody likes to be a nag. The anarchists and “non-hierarchicals” don’t do it because it isn’t glamorous, goes against their ideology of there being “spontaneity” in all things at all times. A core group of people giving directions to less-committed people would be labeled a recipe for liberalism. All must be (equally) involved. Except, of course, they never are and never could be. The Trots don’t do it because they don’t really know how to get people involved, and they already know how to book coaches for marches and have someone shout through a megaphone. Everyone else is simply there to be sheep. The NGOs don’t do it because – like the other two types – very little of what they actually do is supposed to achieve a specific result. They sort of hope that the vague wishes of “society in general” will magically percolate through politicians and the political process, producing the Wished-For Thing. This entry was posted in activism, bureaucracy, climate, competence and tagged Gross Point Blanke, John Cusack, meetings, movement-building, social movements. Bookmark the permalink.